On Second Scoop: Ice Cream Reviews: Have you tried any of the 2017 Blue Bell ice creams? Have you tried any of the 2017 Blue Bell ice creams? So, we're at the end of summer and I'm wondering, have any of you tried any of the new 2017 offerings from Blue Bell ice cream? There was Sweet & Salty Crunch in July, Bride Cake back in May, Ice Cream Cone in February, and now we've got Banana Split Sundae. Thoughts? 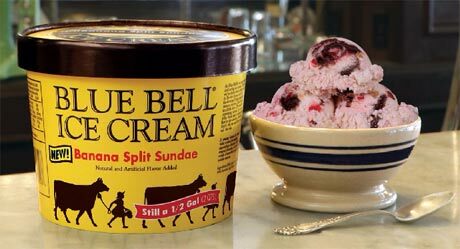 BRENHAM, Texas, August 24, 2017 – In honor of National Banana Split Day, Blue Bell Ice Cream is releasing a new flavor and it couldn’t be more perfect. This ice cream is sure to be the cherry on top of your day! Celebrate with Banana Split Sundae Ice Cream, in stores beginning Aug. 24. Banana Split Sundae is a creamy banana ice cream mixed with crushed pineapples, maraschino cherries, and chopped roasted almonds, all surrounded by swirls of strawberry and chocolate sundae sauces. The banana split and the sundae go hand in hand. Many ice cream experts credit David Strickler as the inventor of the banana split. Strickler, a 23-year-old employee at a pharmacy in Latrobe, Pa., enjoyed creating different sundaes for the pharmacy’s soda fountain. One day, in 1904, he decided to combine three scoops of ice cream with a fresh banana and the rest is history. Banana Split Sundae is available in the half gallon and pint size. Just a coincidence, banana split flavors usually have either a banana base or a swirled banana and strawberry base. Bride Cake is the best flavor of ice cream ever!!!! The new banana split sundae is good (how could it not be, it's blue bell), but I found it to be cloyingly sweet. Wish the chocolate sauce would be a little darker and thicker like fudge and less sweet and syrupy. Have you reviewed Grooms cake yet? Blue Bell reviews are rare here since I don't have access to them and they don't share review samples. Sorry. My favorite Blue Bell Icecream for years has been the Banana Split. I have been waiting for it to get back on the shelves and found it today. Perhaps someone pissed in my half gallon but it is the worst Blue Bell Ice cream....No it is the absolute worst ice cream I have ever tasted. I still have a nasty taste in my mouth after 30 minutes. Wow. That's a pretty harsh comment for your favorite ice cream. I wonder what changed. Take it back for a refund and wait for another lot/batch of it maybe? Good luck! I love Blue Bell Banana Split.I hope it is not being discontinued. I dont like the Blue Bell Sundae. To much chocolate syrup it over powered all other flavors.